*This experience was sponsored by Pink Jeep Tours, and we thank them for hosting our family for this awesome adventure. They’re ubiquitous. 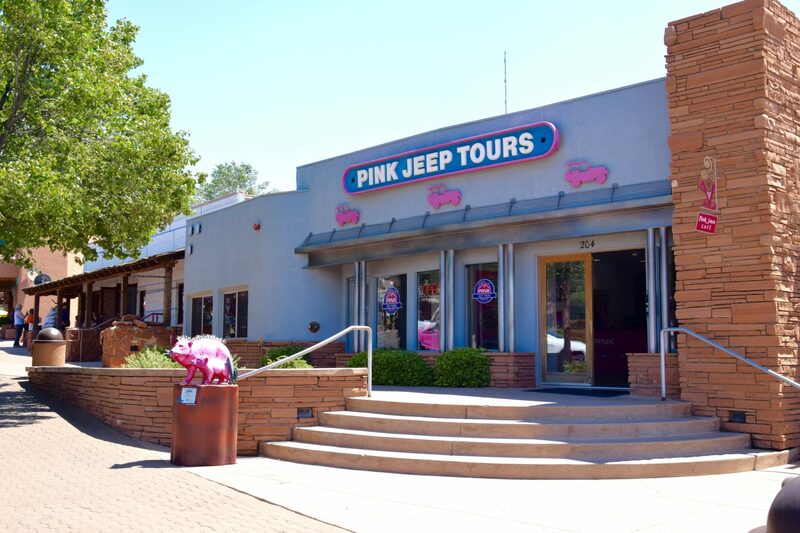 We must have counted at least a dozen pink jeeps parked around town as tangible advertising for Pink Jeep Tours, and that didn’t even count the actual jeeps full of fun-loving visitors in the midst of a tour. 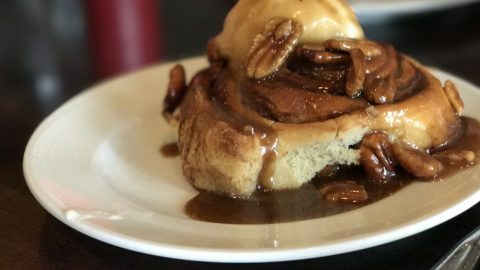 Perhaps for locals this might be a little much, but we found it charming – especially since we had such a blast on our own Pink Jeep experience. 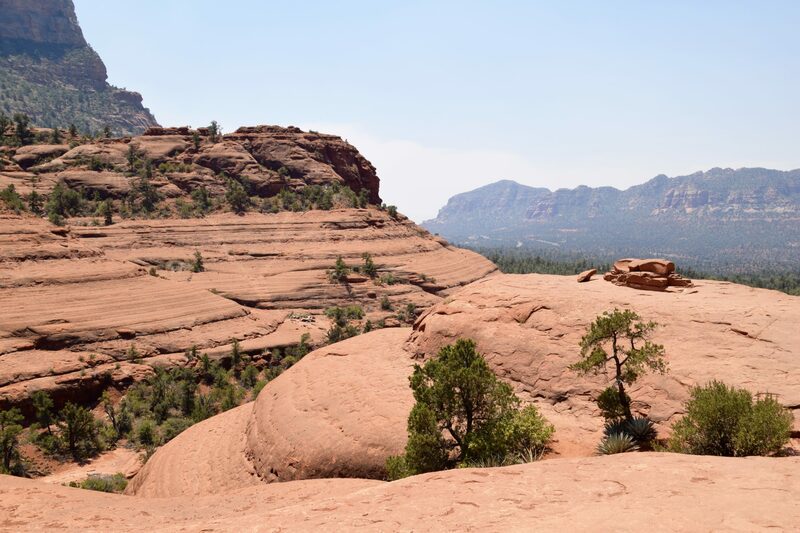 Quite some time ago, some smart business owner decided to make their off-road tour of gorgeous Sedona, Arizona rock formations stand out by painting all their touring vehicles pink. Brilliant. So our family went along for the ride as guests of Pink Jeep Tours, and loved every minute of it. In case you didn’t know, it’s hot and sunny in Sedona most of the year – and we visited in the heat of summer when it was over 100 degrees. Bring a bottle of water for each person, a hat, sunscreen and good walking shoes because you get out of the jeep to walk on the rocks a bit. Also, the ride is bumpy (you are off-roading after all) so wear comfortable, loose clothes you don’t mind getting a little dusty. 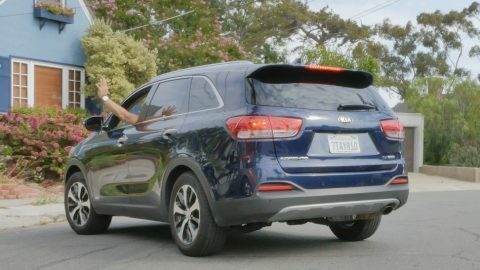 For those of you who are worrywarts, just stop it – you will be fine! Pink Jeep Tours’ signature is the Broken Arrow Tour, although they offer many other interesting choices. Our whole family loved this tour, because we felt like our little group were the only people in this canyon. OK, maybe there were some other Pink Jeep tours around as well, but still. (Fun factoid: It’s called Broken Arrow because this area used to be the film site of many old Hollywood westerns, including a Jimmy Stewart flick called Broken Arrow). Our guide David was terrific and knowledgeable, with a wry sense of humor that made his narration even more entertaining. He told us about the sedimentation that formed these rock formations, pointing out the layers of color in the massive cliffs and explaining why this tectonic shift happened millions and millions of years ago. It was like a Cliff’s Notes version of an outdoor geology lesson – the adults loved it, and the kids tuned out. Oh well, maybe some of those details did seep into those forming brains. 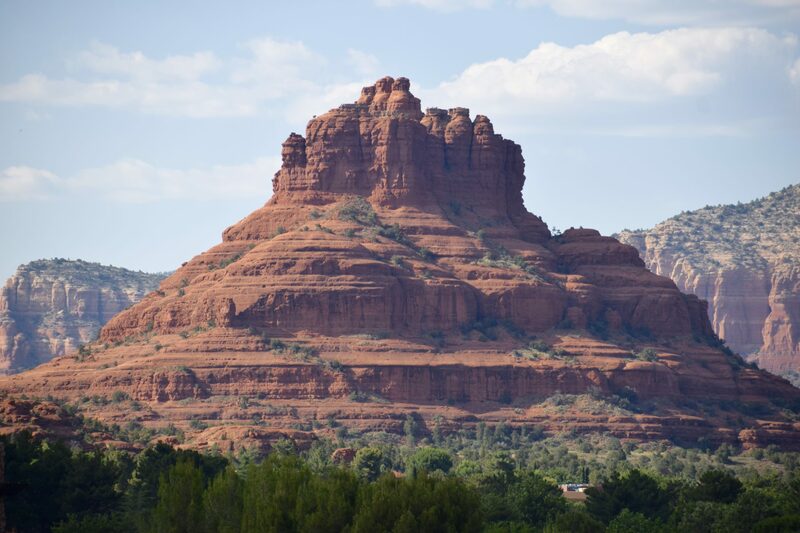 Most of Sedona’s famous vistas are enjoyed from a distance, so you can take in the huge scale of formations like Bell Rock, Castle Rock and Cathedral Rock. All are postcard-perfect examples of what has brought so many visitors to Sedona. Having said that, the Pink Jeep tours allow you to get up close and personal with these formations, seeing them up close and studying their detail. In a couple of instances, David parked the jeep and took us on a short walk to the top of a giant rock so we could touch and feel the stone. He even pointed out a fault line from eons ago, which put a straight-line crack through the giant rock we stood upon. It was geeky cool. One of the coolest things about this tour was the incredibly steep terrain we traversed in our sturdy jeep, both up and down. The kids squealed with laughter as we climbed up tiny pathways that seemed so vertical we should fall backwards. Don’t worry, it felt safe the whole time – just VERY STEEP. Even more dramatic were the sections of path downwards that was sometimes at a 45-degree angle (or more). David expertly guided the jeep over gigantic boulders in our path as we descended to a more reasonable angle of pathway. It was so cool, and a tiny bit unnerving. But that’s the fun of it! We laughed the whole way, amazed to look back at the mountain we had just descended. People travel to Sedona from all over the world to see these famous red rocks. This tour serves up all that and more, including flora and fauna. We saw many colorful birds; squirrels and we hear local mule deer are regular morning visitors. No snakes though, thank goodness. The rattlesnake population does well in Sedona (or so we are told), but we never saw a single one. The plant life amazed us, and our guide pointed out various plants we could eat if stranded, use for shampoo if feeling a little soiled, and store for sources of water if our thirst grew too great. Not that we truly needed to access any of these emergency rations, but it’s always good to know for the next time you find yourself alone in the middle of the high rocky desert with a dead phone and no hope. Aaaaanyway, back to the fun. 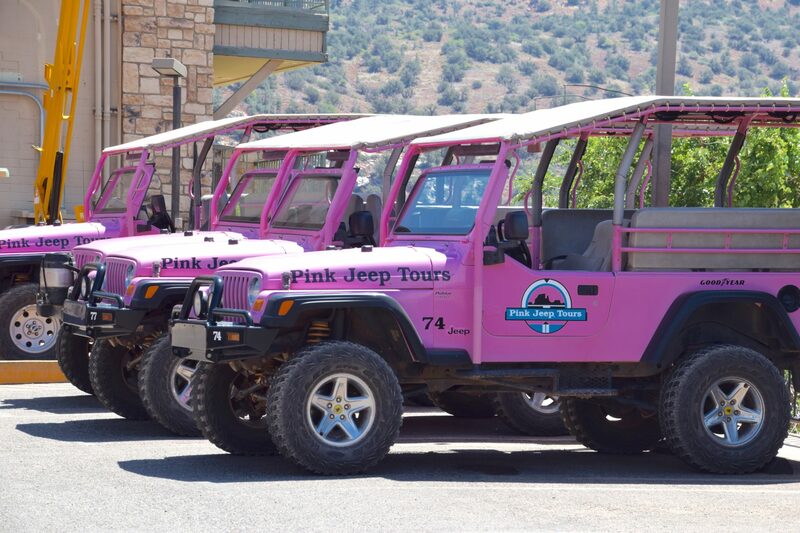 There is a reason why these Pink Jeep Tours are ubiquitous – it’s because they are so darn cool. This is simply a must-do activity on your visit to Sedona. Don’t get all anti-commercial and crystally-vortexy on me. This experience is well worth your time, no matter how enlightened you are. So lovely that jeeps are pink! Good idea, they most certainly stand out where ever they go. And they seem to go well with red rocks of Sedona! 🙂 Love those landscapes! The red rocks are amazing. I am sure that the family got a thrill out of the very steep climbs! It looks like a great activity. Jeep tours are such fun! Plus I’ve heard that Sedona is stunning! Put everything together with pink jeeps, and you have a recipe for a wonderful day! This surely does sound a lot of fun. I am from Georgia (the country), and we have lots of off-road paths. A friend of mine was visiting me last year, and I took them on one landmark where we had to go off-road. They loved it!